As the term enters exam period, we would like to remind all Library patrons of the Library noise policy. Please be mindful of your own noise levels to ensure a comfortable and respectful study environment for everyone. The 5th floor is divided into three noise zones to ensure students are getting a study environment that best suits their needs. Want to study amongst friends and maybe have a quiet conversation? The area at the top of the spiral stairs is our Collaborative Zone and will be perfect for you. Are you the type that doesn’t mind a little background buzz? The Quiet Zone is a whispers-only individual study space. Need absolute silence? 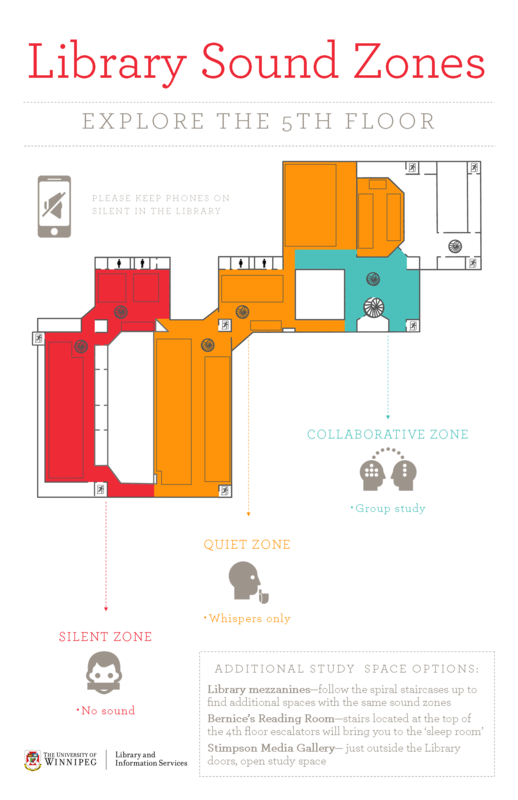 Venture deeper into the Library to find our Silent Zone. There’s a space for everyone at the Library. See the map below for more details. Best of luck during exams!